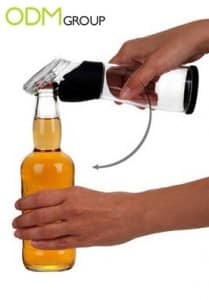 A really cool promotional idea can be the result of a simple combination of everyday products. 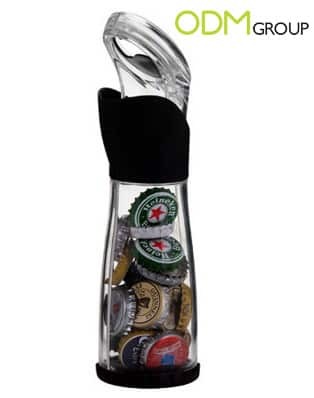 The 2-in-1 bottle Opener/Cap Collector is an excellent example to illustrate this! 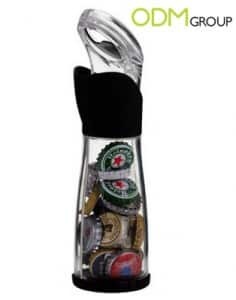 It combines the ability of a bottle opener with the functionality of a collector’s bottle! This is definitely an innovative promotional idea that your company can consider. Why should you consider this promotional idea? At first glance, this promotional really looks like any regular water bottle. Upon closer inspection, you’ll realise that it incorporates the idea of a bottle opener and water bottle. This promotional item comes in handy to people who enjoy watching games with their friends. No more hassle of finding the trash bin and missing that crucial moment in a game! What ODM really loves about this nifty item is that it can be easily branded with a company logo to enhance brand awareness. Given it’s functionality, it creates a free advertisement whenever the product is being used. Doubled with it’s durable characteristic, it helps guarantee long term visibility which could boost brand recall. With such a multi-purpose and effective promotional idea, what are you still waiting for? Doesn’t this remind you of our very own 4-in-1 Coolzee? Feel free to contact our ODM team here if you’re interested in customising your own promotional merchandise for your upcoming marketing campaign! You can also check out our beer promos website for more ideas for drink promotions!